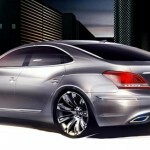 Korean manufacturer Hyundai has revealed two sketches with the future generation of the model Equus. The new flagship of the Koreans will start in 2010 and will have rear drive and automatic transmission with 8 steps. Under the hood we find a V8 engine of 4.6 liters, later will be introduced and a 5.0-liter V8 that will develop over 400 horsepower. 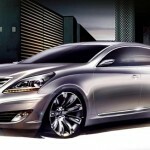 The new Hyundai Equus will be equipped with several advanced technologies, including the headlamps and taillights with LEDs, Vehicle Stability Management System, Lane Departure Warning System and Pre-Safety Seatbelt System.